This piece I wrote was previously seen on Chicks Dig the Long Ball earlier this week. If you paid close attention to certain national analysts this season, you probably heard them talk or write about how deep the Phillies low minor league teams are with great prospects. The Phillies’ Class A affiliate, the Lakewood BlueClaws, won the club’s second straight South Atlantic League title and became the first club since Savannah in 1994 to repeat as league champions. They also became the very first team in league history to win their division in the first and second halves and then go on to win the league championship. Lakewood was loaded with prospects this season. One, short stop Jonathan Villar, was held in high enough regard that he was part of the collection of players that was sent to Houston in a trade for Roy Oswalt in July. The Phillies had plenty of home grown talent come through their system in the 2000s. Ryan Howard, Carlos Ruiz and Cole Hamels are all current Phillies stars who spent time as BlueClaws on their ways to the big show. They were not there at the same time, however. The Phillies stars of tomorrow could very well have gelled together in Lakewood this year. In a recent poll conducted by The Reading Eagle that ranked the Phillies’ top twenty prospects, four of their top five and six of their top ten ranked prospects were members of this season’s championship Lakewood team. Among the highly ranked BlueClaws prospects was first baseman "The Boss" Jonathan Singleton, who turned 19-years-old the day Lakewood defeated Greenville in the SAL Championship Series this past Saturday. Singleton was an eighth round selection in the 2009 amateur draft. After beginning the season in extended spring training, Singleton debuted with Lakewood in May and proceeded to post a .290 batting average with 14 homeruns and 77 RBI as an 18-year-old playing A-Level baseball. Last week I spoke to Phillies General Manager Ruben Amaro, Jr. about several Phillies developmental matters. Amaro said the Phillies believed in Singleton’s abilities and disagreed when I suggested he came out of nowhere to excel up the prospect rankings this season. “Jonathan obviously developed very quickly in this league, which is a very tough league for such a young player,” Amaro said. Sebastian Valle, a 20-year-old catcher, was signed as an amateur free agent in 2006 out of Mexico. In 117 regular season games this season, Valle posted a .255 batting average and slugged 16 homers while driving in 74 RBI. In game four of the SAL championship series, Valle hit a no-doubt-about-it homerun onto FirstEnergy Park’s left field berm that gave the ‘Claws a lead that they would not relinquish. Valle’s undeniable talent and was part of the reason the Phillies felt comfortable trading away catching prospect Travis D’Arnaud to Toronto last off-season. If I had to place money on one player from this season’s Lakewood team to reach the Majors one day, it would be Valle. Lakewood hitting coach Greg Legg is impressed with Valle’s improvements this season. “He’s got power, he can catch, he’s getting better at throwing the ball down to second, he’s quicker, he blocks balls, he calls a good game. He’s gonna play at higher levels,” Legg told me last month. Julio Rodriguez, a righty hurler who turned 20 in late August, is a finesse pitcher who lacks the speed that some of the other prospects possess, but had impressive strike out totals (126 K’s in 96 1/3 innings at two levels this year) by keeping opposing hitters guessing with solid off-speed pitches. His fastball regularly reaches 90mph on the radar gun. Lakewood manager and former Phillie Mark Parent recently said of Rodriguez, “He’s done nothing but impress us. In any role…long relief, starting, I’m very impressed with him.” Rodriguez is versatile and will certainly pitch at higher levels. They players I’ve spoken about are just the better known names on the Lakewood roster. 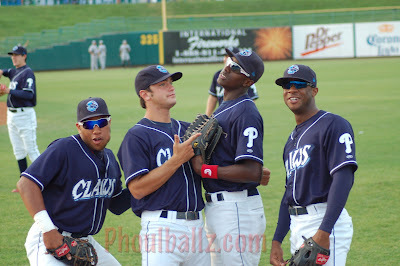 More BlueClaws players like 20-year-old RHP Jonathan Pettibone, who won two games in the playoffs, RHP Josh Zeid, who was named Phillies minor league pitcher of the month in April, All-star infielder Jeremy Barnes, who played at Notre Dame and wore the same jersey number that Brad Lidge wore there (20), and outfielder Leandro Castro, who led the club with 81 RBI this season, were all key contributors to the club all season long and have the potential to move up the ranks toward the majors. And don’t forget former top draft pick Anthony Hewitt who moved to the outfield from shortstop this season. Hewitt was signed for roughly $1.4 million, so the Phillies will continue to work with Hewitt, who batted .202 in 116 games this year, on his pitch recognition. Getting used to post-season action at a young age surely won’t have any ill effects on these players. The Phils of the future are simply playing ball the winning way…the Phillies way. For updates and unique stats, follow PhoulBallz.com on Twitter by clicking HERE.